The F-35A stealth fighter, the Air Force version of the plane. 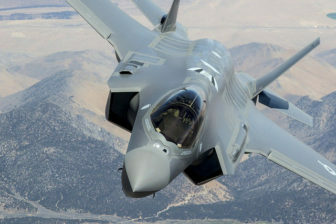 Washington – A dogfight in Congress over the stealthy F-35 and an older jet fighter has been rejuvenated and its outcome could impact Pratt & Whitney jobs in Connecticut. The Pentagon surprised many by cutting back on the number of F-35 stealth fighters it has asked Congress to pay for this year. At a cost of about $8 billion, the Pentagon requested 78 F-35 jets, which are built by Lockheed Martin. That’s down from the 84 fighter jets the Defense Department had projected for 2020. The Joint Strike Fighter’s engine is manufactured by Pratt & Whitney. The Pentagon’s budget request also asked for eight new “advanced” F-15X jets—to be used by the Air Force and the Air National Guard. The F-15X is built by Boeing, whose engines are made by General Electric. The decision to buy fewer F-35s and start buying the F-15X, an upgraded version of a nearly 50-year-old F-15 fighter Boeing last built for the Air Force in 2001, has started a lobbying war in Congress. Republican Sens. John Cornyn and Ted Cruz of Texas, Susan Collins of Maine, Marco Rubio of Florida, and Lisa Murkowski of Alaska have sent a letter to President Donald Trump asking him to rethink the F-15X buy. All five senators come from states that make the F-35 or where the jet fighter will be based. Meanwhile, Rep. John Larson, D-1st District, who co-chairs the Congressional Joint Strike Fighter Caucus, is a leader of another lobbying campaign for the F-35. Larson – along with 100 other House members — recently sent their own letter to the leaders of congressional committees who will draft the Pentagon’s 2020 budget. In that letter, lawmakers asked for 102 F-35 fighter jets, 24 more than the Pentagon has requested. Larson said the 93 jets that were funded in the Defense Department’s 2019 budget support 15,574 jobs in Connecticut, an increase of 7,340 jobs over last year. Larson also determined the F-35 program has a total economic impact of more than $1.5 billion in Connecticut, an increase of more than $415 million over 2018. While the F-35, and its maker Lockheed Martin, has its supporters in Congress, the F-15X, produced in St. Louis, also has its own champions, especially among the members of Missouri’s congressional delegation. But more importantly, perhaps, is that Acting Secretary of Defense Patrick Shanahan, a former Boeing executive, was friendly to the argument that the Air Force should acquire “fourth generation” F-15Xs alongside “fifth-generation” F-35s. The Pentagon says the F-35 and F-15X are not competitors because the non-stealthy F-15Xs would fly low-risk homeland-defense missions over the United States, while the stealthy F-35s would deploy overseas for major combat against high-tech enemies. Like other supporters of the F-35 program, Deptula said a boost in the number of Joint Strike Fighters is needed. “Yet instead of investing in more modern F-35s, the Pentagon’s 2020 budget request seeks billions of dollars for new-built F-15EXs—an aircraft design whose roots extend back to the late 1960s,” Deptula said. The fighter debate will continue as the congressional budget process grinds on. One argument that may prevail over all others is the cost of the competing fighter jets. The cost of the F-35 slated for the Air Force has dropped to about $80 million per jet, and Lockheed Martin said future buys could be cheaper. Meanwhile, supporters of the F15X may cost a little more in the beginning because of startup program costs, but the jet will save the Air Force a lot of money down the road because construction costs will drop and there would be no need to retrain aircrews – or ground crews – who are already familiar with the old F-15.